Fraser Murphy was a pacy, tenacious rover who finished runner-up in the 1983 Liston Trophy (awarded to the Best and Fairest player in the VFA) after starring for Geelong West in their Grand Final loss to Preston. Originally from Bell Park within Geelong's local League, he came to Carlton in 1984, and played finals football in five of his eight seasons with the Blues. He is perhaps best remembered for missing out on a place in the 1986 Grand Final side through suspension – and a year later, gaining a late inclusion in the ’87 Premiership team. Although he found consistency a problem throughout his career (as do many forward pocket specialists) "Smurf" was a crowd favourite because he often kicked handy goals in tight games. Murphy’s debut game for Carlton, in round 1, 1984 was a landmark match. Carlton thrashed North Melbourne by 137 points at Waverley Park, and in the process, unveiled a team that featured five new faces in a changing of the guard at Princes Park. Joining Murphy in Navy Blue for the first time were Tom Alvin, Wayne Blackwell, David Honybun, and boom WA forward Warren Ralph – who kicked 9 goals to help Bruce Doull celebrate a new club record in his 329th senior match. Murphy quickly established himself in the team as a goal-kicking forward pocket, and played finals football in each of his first two seasons – although Carlton was knocked out of flag contention at the Semi Final stage in both years. In 1986, the Blues clicked into top form and won their way into the Grand Final with an impressive Semi Final victory over Hawthorn. But during one of the many skirmishes, Murphy was reported for striking Hawthorn’s Greg Dear, and ruled out the Grand Final by a one-match suspension. Hawthorn then accounted for Fitzroy in the Preliminary Final, and staged a big form reversal in hammering Carlton by 42 points to claim the flag. Twelve months later, Murphy benefited from the other side of outrageous fortune. He was left out of the team when Carlton and Hawthorn clashed yet again in the 1987 Second Semi Final, replaced by Bernie Evans. Carlton duly beat the Hawks by 15 points, and Evans himself was reported for striking. Two days later, the VFL tribunal suspended Evans, so Murphy was recalled to replace him. Carlton won the 1987 Premiership in the hottest weather ever recorded on Grand Final day. After Hawthorn's champion full-forward Jason Dunstall was ruled out of the game by an ankle injury, David Rhys-Jones kept the Hawks' other crack forward Dermott Brereton under a tight rein all day. The Blues were fitter and fresher than the Hawks, and it showed. Murphy spent most of the match on the bench, but came on late and helped put the result beyond doubt by running onto a deft tap-on by Adrian Gleeson, and banging through Carlton’s 15th and last goal in an emphatic five-goal victory. Smurf played on for another four seasons after that wonderful day and continued to give the Blues honest and committed service. But the emergence of Paul Meldrum, David Glascott, Craig Bradley and others limited his opportunities. He played in the Carlton Reserves Premiership team in 1990, and at the end of that season asked to be released to another club. In appreciation, he was given one more senior game in round 4, 1991 against Essendon at Waverley Park. Unfortunately the Blues couldn’t give their mop-topped terrier in the number 30 guernsey a win to finish up with, but he left Princes Park with all-round goodwill. 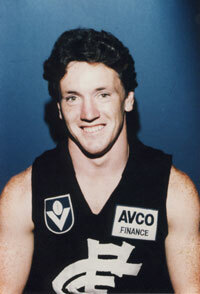 Having registered for the short-lived mid-season draft in 1991, Murphy was picked up by Collingwood at selection number four. However, to the relief of everyone apart from the mob at Victoria Park, Smurf didn’t sully his reputation by playing a senior game in the prison bars guernsey, and retired at the end of that year. Blues team-mate Dean Strauch was also selected by the Magpies in the same draft, but he too, failed to play a game with them. Contributors to this page: Grisdesa , PatsFitztrick , molsey , pblue , Bombasheldon , true_blue24 , Jarusa , nikki and admin . Page last modified on Monday 15 of October, 2018 17:32:53 AEDT by Grisdesa. 1994 - Rhys-Jones on report again (25/05/94).